What is Applied Kinesiology (AK)? In short, AK uses muscle testing as a primary feedback mechanism to examine how a persons body is functioning. While this may seem like a bold claim, the AK practitioner has a detailed knowledge of muscle movements and their relationship to the body and its complex systems. When properly applied, the outcome of an AK diagnosis will determine the best form of therapy for the patient. And since AK draws together the core elements of many complementary therapies, it provides an interdisciplinary Wholistic approach to your total health care. 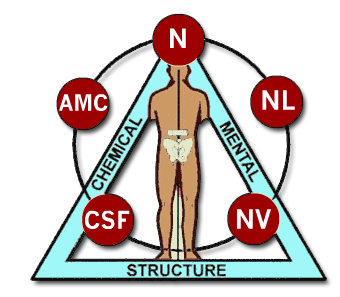 AK uses the triad of health  structural, chemical, and psychological factors  to assess the proper balance of an individuals health. When a person experiences poor health, it is due to an imbalance in one or more of these three factors. Valentine, Tom and Carol with Douglas P. Hetrick, D.C. Applied Kinesiology. Healing Arts Press, 1987.